Child Protection Plan safeguards children’s future by providing Rs. 400,000 for just Rs. 399 per year to help fund his/her education expenses should the Policy holder die or become permanently disabled due to an Accident. Financial Protection: Lump sum payment of Rs. 400,000 will be provided to Insured’s Children (or their legal guardian) to guarantee financial protection in case of Death or Permanent Disability of the Policy Holder due to Accident. Paperless Enrolment Process: Paperless enrolment process allows enrolment in a matter of few minutes. No medical examinations are required for enrolment. A Policyholder shall not be covered under more than one Child Protection Plan offered by Chubb Insurance. In the event that a Policyholder is covered under more than one such Plan, Chubb will consider that person to be insured under the Plan first issued. Chubb will refund any duplicated insurance premium payment which may have been made by or on behalf of the Policyholder. Death or Disability due to pre-existing disease. Child Protection Plan is underwritten by Chubb Insurance Pakistan Limited. 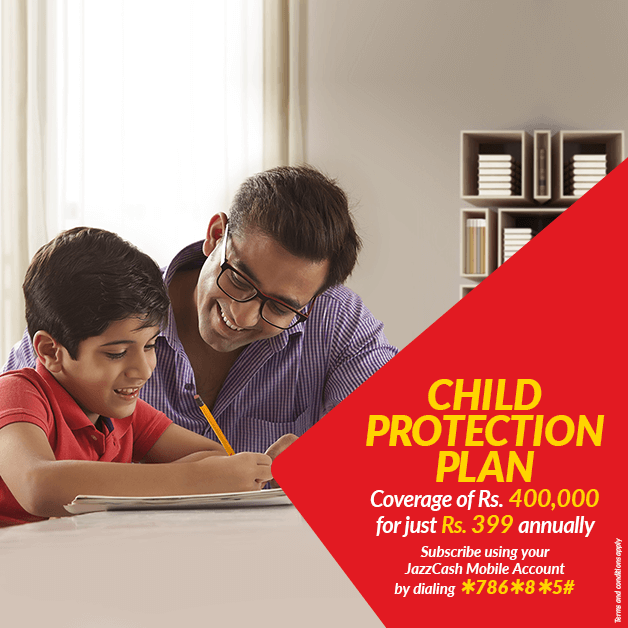 Jazz Cash and Mobilink Microfinance Bank’ are distributors of Child Protection Plan and Chubb Insurance Pakistan Limited is responsible for handling and paying all the claims. For claims and to request the hardcopy of policy document, please call Chubb Insurance Pakistan Limited at nationwide toll free number 0800 54321 or UAN 021-111-789-789 or WhatsApp 03094440557 or email: Pakistan@chubb.com. Chubb Insurance Pakistan Limited is located at 6th Floor, NIC Building Abbasi Shaheed Road off Shahra-e-Faisal, Karachi. Does Child Protection Plan provide cover on Natural Death also? Child Protection Plan provides 24 hour worldwide cover for Accidental Loss of Life or Accidental Permanent Disability. Loss of Life events like sniper firing, armed burglary, murder, drowning, falling from stairs are all covered. Natural Death due to disease or illness is not covered. Or call our JazzCash helpline number 4444. Our representative will guide through the claim process. Claims are settled within seven (7) business days, after completed documents are received. Customers can cancel their subscription within 14 days of registration by calling 4444.